This week especially I am feeling entirely too wrapped up in myself. If there is any group of people capable of unwrapping a person from himself, so to speak, it is the saints. The saints – the men and women who are heroes of the faith, the holy ones of God. They are those who have reached the destination and reward we hope to reach. This is why they are worth studying, emulating and entreating for their intercession. Today is the Feast of St. Joseph. This man holds a special place in my heart as the patron of my university household (sort of a faith-based sorority). I overlooked him until those years at Franciscan. This isn’t surprising as St. Joseph is a man easily overlooked. He speaks no words recorded in the Gospels. He appears only in the first chapters of Matthew and Luke and never thereafter. We do not have record of his death. Yet he is the standard for men, for husbands and fathers, indeed for all the lay faithful. In a world where we are constantly speaking, texting, messaging, etc., silence is not only difficult to achieve but sorely undervalued. We equate silence with stillness. While that can be the case (perhaps needs to be the case more often), stillness is not the only circumstance for silence. For as much as St. Joseph can be called a man of silence, he is equally a man of action. A decision based on righteousness (Matthew 1:19); a change based on a message from God (Matthew 1:24); a journey based on another message from God (Matthew 2:13-14); the actions of Joseph are recorded with great simplicity because his following of God’s will was simple. Discern His will and do it. No arguments, no complaining, no doubting. His place in the Holy Family as foster-father of Jesus, husband of Mary, protector and provider of the family raises him to be the example for all husbands and fathers. He lays out a gold standard for women waiting for their husbands and women actively serving and loving their husbands. His obedience to the commands of God, humble endurance of hardship, total dedication to Christ, and tender honor of Mary render him a model for every member of the Christian laity. Joseph, to me, is a man of courageous faith, boldness of spirit, and steadiness of character. He does not do these things loudly or in a manner that garners attention to himself. Joseph is the living, breathing fulfillment of the pledge, ad majorem Dei gloriam – to the greater glory of God. Oh, St. Joseph, whose protection is so great, so strong, so prompt before the throne of God, I place in you all my interests and desires. 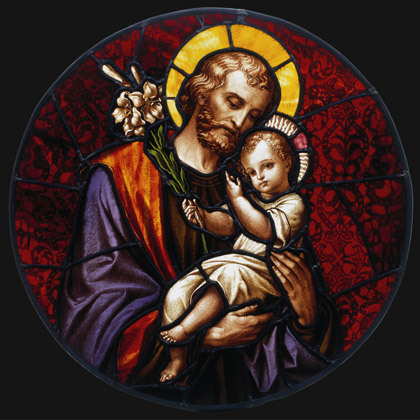 Oh, St. Joseph, do assist me by your powerful intercession, and obtain for me from your divine Son all spiritual blessings, through Jesus Christ, our Lord. So that, having engaged here below your heavenly power, I may offer my thanksgiving and homage to the most loving of Father. Oh, St. Joseph, I never weary contemplating you, and Jesus assleep in your arms; I dare not approach while He reposes near your heart. Press Him close in my name and kiss His fine head for me and ask Him to return the kiss when I draw my dying breath. St. Joseph, patron of departing souls, pray for us. Amen.